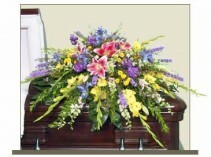 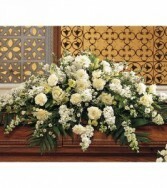 This casket spray with its array of white carnations, larkspur, asters and stock adds a pure and loving gesture to the service. spray arrives decorated with white carnations, larkspur, lisianthus, asters and stock, and simple foliage. 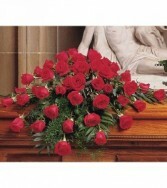 Approximately 45" W x 36" H Flowers may vary depending on availability.